Celestial tea Sleepytime Extra tea bags is a relaxing herbal tea that contains the original Sleepytime blend of camomile, green mint and other soothing herbs. What's extra in this blend is that Valerian has been added, which has long been considered to be naturally soothing, for a particularly soothing cup. Sleepytime is the tea originally prepared to be enjoyed before bedtime. More than 40 years ago, Celestial created a truly calming herbal tea to help people wind down after a long day. 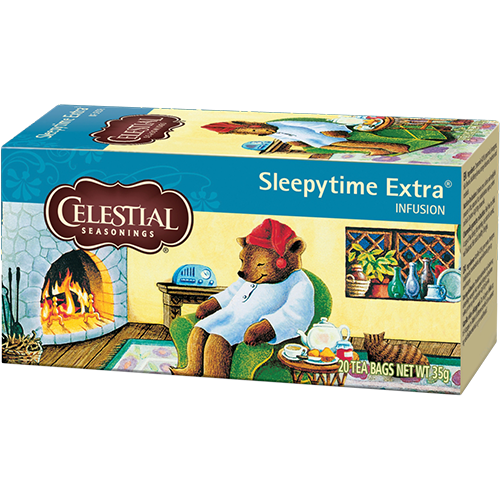 Relax with Sleepytime Extra after a long day!